This is a course designed to get you up to speed with the basics of riding a motorcycle safely on the road. The course is a legal requirement and upon successful completion you will be issued with a certificate (DL196) that validates your licence. (1) Introduction: A driving licence check, eyesight test and a short discussion on how the day will pan out. (2) Practical On-Site Training: Introductions to clothing followed by the controls of the motorcycle and basic maintenance as well as a chance to use the stands, push the motorcycle and safely start/stop the machine. (3) Practical On-Site Riding: Otherwise known as yard work, this section covers observations, biting point, moving off and stopping with effective use of brakes, gear changing, left and right hand turns, slow riding including u-turns and then emergency stops. Please see our Latest News Page to watch the new guide and video from the DVSA about the CBT course. (4) Practical On-Road Training: A lecture type session with plenty of question and answer time to get you up to speed with road signs, position, defensive riding and more from the highway code. (5) Practical On-Road Riding: A minimum of two hours, this session will consolidate all previous learning and allow your instructor to assess your skills. Your instructor will be in radio link with you and will control the session to suit your needs. You will cover a variety of scenarios including town work, traffic lights and speed work within the period on the road. Meet a safe standard - issued with certificate. Do not meet a safe standard - You will be invited back to work on the areas that need it (usually at no extra cost, however if the reason you fail the CBT is down to lack of knowledge of the Highway Code then you will have to pay to re-take the CBT). Don't worry if you have to come back. We will only sign a certificate if we are sure that you are safe, meaning that you can have peace of mind. Driving licence - please ensure that this is up to date and valid. Photocard driving licences need to be renewed every 10 years. We cannot allow you to ride our bikes or take lessons if your licence has expired. Glasses (if required) to read registration plate at 20.5 metres. Any equipment you may have (helmet etc); we're perfectly happy to provide helmets, gloves and jackets, but if you have your own gear and feel more comfortable using this, then that is absolutely fine. Packed lunch if you wish, although there is a sandwich shop onsite. Please wear a minimum of jeans to cover legs because jogging bottoms offer little protection. READ THE HIGHWAY CODE OR A HAVE WORKING KNOWLEDGE OF THE HIGHWAY CODE - IT IS THE ROAD LAW AND THEREFORE ESSENTIAL! We ask for you to arrive for your CBT at 9am prompt as the earlier we start the more time we have to work on correcting errors increasing your chance of completion within the one day period. 17 - 19 year olds: Can now only ride a motorbike or scooter not larger than 125cc and this vehicle must not have a higher output greater than 14.6 BHP. 19 - 23 year olds (or older): Can now only ride a motorbike or scooter no less than 395cc with a power output no smaller than 33 BHP and no higher than 46.6 BHP (35KW). Once a test is passed then you can only ride a vehicle that is within these parameters. Anyone 24 years of age or older may take their test on a Catagory A motorbike or scooter (this is a motorcycle with a 595cc or larger engine which has a power output higher than 54 BHP), therefore meaning that once the tests have been passed on this type of motorcycle then they can then ride any bike of any size engine with no restrictions (other than those made by the law!). This scheme is known as the Direct Access Scheme or DAS. This was introduced on 19/01/2013 with more planned changes for 2018. 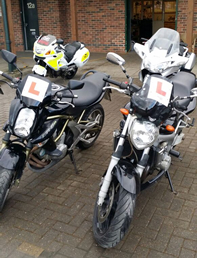 If you are 19 years or older and have held a Sub Category A1 licence for more than 2 years you can now move into Sub Category A2, but you will need to take both Module 1 & Module 2 again on the size motorcycle that is within the parameters of this category. At the age of 21 and you have passed the tests in Sub Category A2 and have held this for more than 2 years you can now take Module 1 and Module 2 in Category A on the size of bike which meets Category A requirements (must be larger than 595cc and have a power output of more than 54 BHP). These recent changes have caused confusion throughout and sometimes it may be better to visit the D.V.S.A Website or telephone us, or call into the office to help clarify things. The average person should plan for around 10 - 13 hours of tuition which is usually done in three hour slots, however we can easily accomodate longer or shorter lessons to meet your individual needs. If you need less tuition, we'll tell you, the same as we'll be honest if you need a little more. In lessons you will cover all elements required for test, including u-turns, emergency stops, dual carriageway work, town work, box junctions, country roads and more. Most importantly - all lessons should be fun! Sometimes a rider with limited experience may need to step up to a larger machine. If this is the case then a cross over lesson can be provided which will last approximately two hours. For the first hour you will go out on a 125cc machine with an instructor to gently ease you back onto a motorcycle. After an hour (or sooner if all things are going well) your instructor will bring you back to the unit and introduce you to a larger machine. The biggest difference you will notice is the weight. Once familiarised with the larger machine, you will then go back onto the road to help you become more accustomed to riding a faster and more powerful machine. There is a minimum speed requirement of around 32 miles per hour (50 kilometres per hour) for the hazard avoidance and emergency stop exercises. There is no minimum speed requirement for the first cornering and controlled stop exercise. However you must pass Mod One before you can do Mod Two. For more information on taking the Mod One & Mod Two tests please click here to visit the DVLA Website .